It’s truly a shame that poetry is so often thought of as inaccessible, hopelessly and purposefully snarled with obscurity and flabby with rococo intellectualism. Great poetry should work on many levels, and thus appeal to a wide audience from those who appreciate it for its pure beauty and those that delight the complexity of further analysis. Maxine Kumin is a poet whose entire oeuvre is rooted in what she knows: her farm in New Hampshire, where she works in the ground, keeps horses. Her poetry is the dirt, it is the food scrap, it is the snort of horses, but she makes these mundane details peal out their secret beauty; she makes them transcendental. 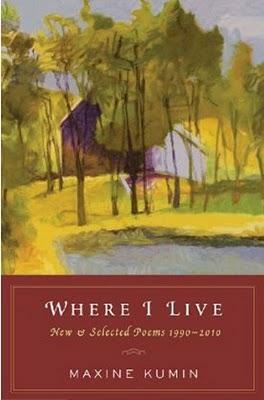 Where I Live is a collection of poems that spans two decades of the poet’s illustrious career, which includes a Pulitzer Prize, a stint as Poet Laureate of the United States and countless other honors. The collection allows a reader to follow along with the contours of Kumin’s life. As with any life, there are personal and cultural landmarks, some common and others not so: marriage, giving birth, creating a home, a broken neck suffered by falling from a horse at age seventy-three, the death of a close friend, Anne Sexton. All are contemplated with a true, ringing voice and simple grace. Damn all of you with dumpsters. Damn all who do not compost. on bare ground, without water. CEOs with bonuses, corporate jets, trophy wives. It is from this celebratory spirit that she approaches her craft, too, referencing and playing with other poets, taunting and engaging them in her own verse. Her belief in the healing and cleansing power of composting and mucking out and gardening easily becomes a metaphor for her own work as a poet. Her exhilaration for both nature and language sustain one another; in fact, they feed one another, and Kumin, in her eighties, has much fertile land left to till.